This air fryer pork chops recipe is a quick simple take on a classic food we all love – fried pork chop. In place of a typical pan or deep fried, I am using an air fryer to make this comfort food favorite. If you’ve followed me long enough, you know that I am a big fan of air fryer recipes. Whether it’s chicken, pork, beef, or fish, an air fryer can produce delicious and healthy meals. Air frying is trendy right now. Home cooks are trying out all sorts of recipes using an air fryer. Truth is, there is something satisfying about cooking your favorite meals in a healthy way. Similar to a steak, I like my pork chops thick and juicy. I encourage you to get thick pork chops because they stay tender and juicy. There is nothing wrong with the thinner cuts but I tend to overcook them. I normally brine the pork chops for about 30 minutes before cooking. This ensures a juicy and flavorful cooked pork chop. The brine is just a combination of 4 cups of water and 2 tablespoons of salt. I always start with brining the pork chops before I cook them. This is optional, but I recommend you do it. You will taste the difference even with just a 30-minute brine. What kind of brine do I use? As I mentioned above, the brine I use is a simple salt and water combination. If you prefer other brine solutions, go for it. Just like fried chicken, I like my pork chops crispy on the outside. 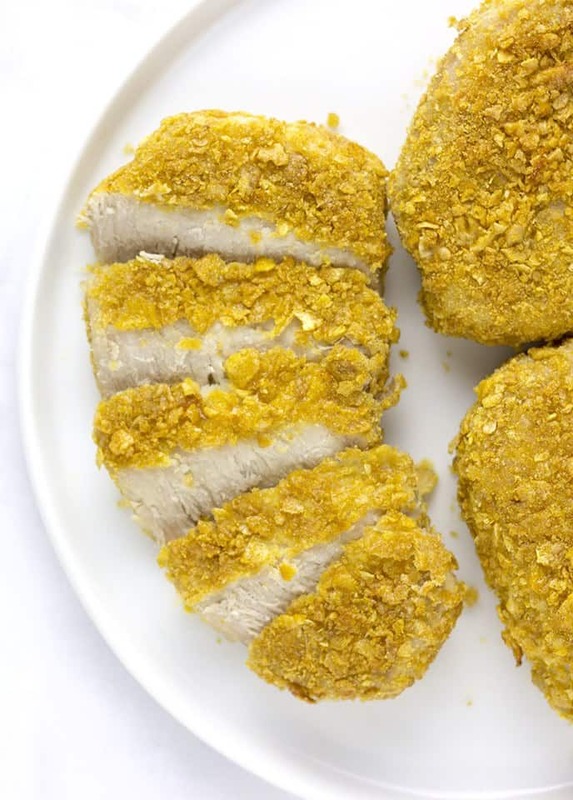 For this recipe, I used corn flakes as the main ingredient for the breading. This also serves as a shield to keep the meat tender and juicy. Chef Tip: Generously cover the pork chop with the breading and press firmly. This will avoid breading from falling off since the fan will be blowing hard inside the air fryer. 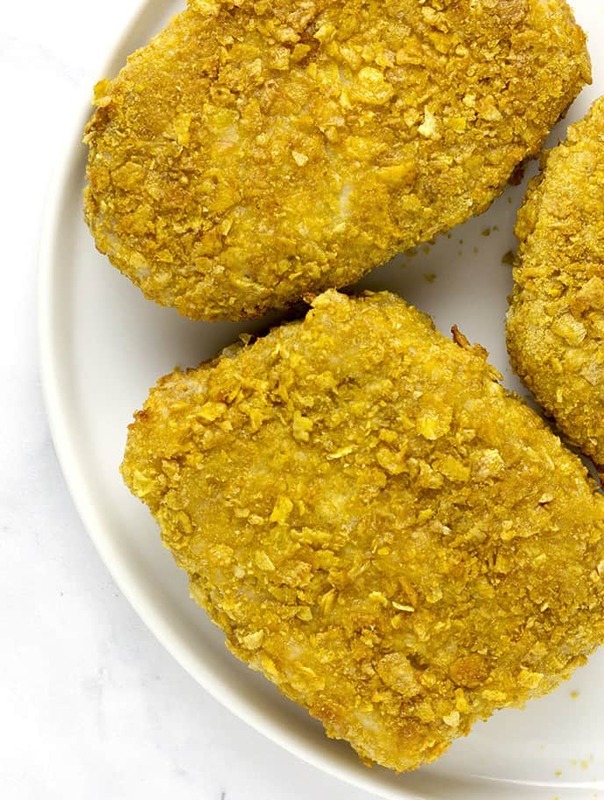 Like other air fried recipes, you will need to spray a little bit of oil to keep the breading intact. It will also help to brown and crisp more evenly. Use a spray bottle or buy a can of olive oil spray. You’ll use a lot less oil this way. Lastly, do not overcrowd the basket. Depending on the size of the pork chops and air fryer, you might only cook 2 to 4 at a time. I have a large air fryer and I can fit 4 pieces without having to stack them over each other. Overcrowding will prevent the pork chops from browning evenly. Chef Tip: Flip the pork chop halfway through the cooking time. This will allow you to brown and crisp both sides evenly. This is also a good time to respray the pork chops with oil. Take a look at that crispy deliciousness! 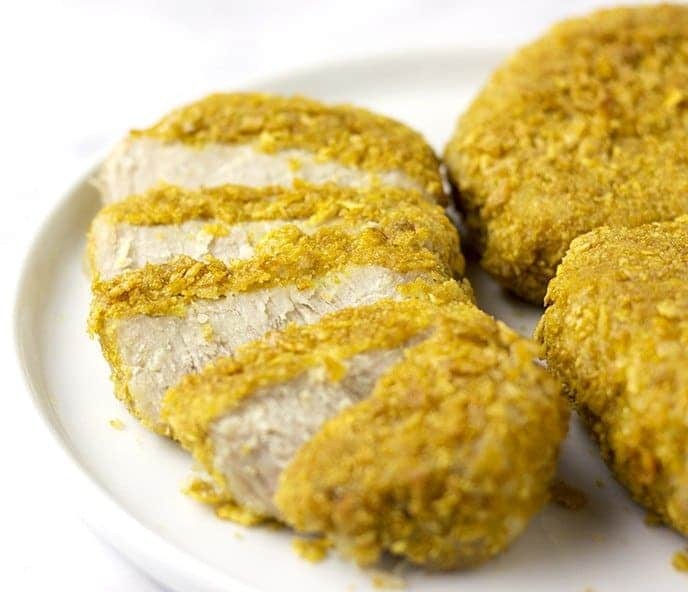 Try this easy and delicious air fryer pork chop recipe. In a large bowl, mix salt and water. Stir until salt is dissolved. Add pork chops and brine for at least 30 minutes. Set aside. In a bowl, add corn flakes and coarsely ground. In another bowl, mix flour, salt, ground pepper, and garlic powder. In a separate bowl, mix egg and milk. Add pork chops to flour mixture and toss evenly. Do this one pork chop at a time. Remove from flour and add to egg mixture. Then add pork chop to corn flakes. Make sure pork chop is heavily coated. Spray olive oil on the pork chops and place in the air fryer. Set air fryer to 400F and cook for 12-15 minutes. Flip and spray oil halfway. How many pork chops can I put in the air fryer? Most air fryers are about 6 quarts and depending on the size of the pork chops, you can fit about 2-4 pork chops. Do not stack them over each other. Can I cook this pork chop in the oven? Yes, you can but it will take a little bit longer to cook. Set oven to 375F and bake for about 30 minutes or until brown. Do you have a spicier version of this pork chop recipe? Add a teaspoon of cayenne pepper and paprika. You can add more or less depending on your taste preference.